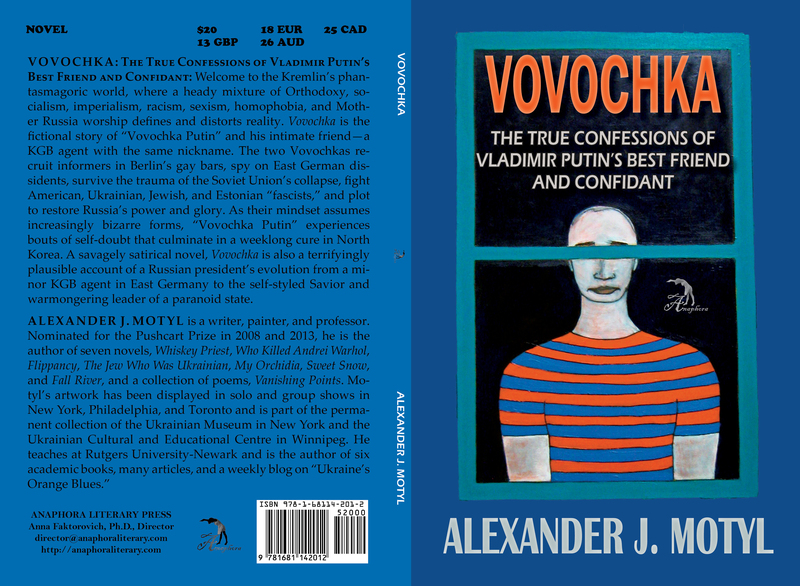 Vovochka: The True Confessions of Vladimir Putin’s Best Friend and Confidant: ($20, 152pp, 6X9”, Print ISBN: 978-1-68114-201-2, EBook ISBN: 978-1-68114-202-9, LCCN: 2015915059, October 2015; Purchase on Amazon or Barnes & Noble): Welcome to Vladimir Putin’s phantasmagoric world, where a heady mixture of Orthodoxy, socialism, imperialism, racism, homophobia, and Mother Russia worship defines and distorts reality. Vovochka is the story of “Vovochka” Putin and his intimate friend—a KGB agent with the same nickname. The two Vovochkas recruit informers in Berlin’s gay bars, spy on East German dissidents, survive the trauma of the Soviet Union’s collapse, fight American, Ukrainian, Jewish, and Estonian “fascists,” and plot to restore Russia’s power and glory. As their mindset assumes increasingly bizarre forms, Vovochka Putin experiences bouts of self-doubt that culminate in a weeklong cure in North Korea. A savage satire, Vovochka is also a terrifyingly plausible account of Vladimir Putin’s evolution from a minor KGB agent in East Germany to the self-styled Savior and warmongering leader of a paranoid state. ARDOR: or How would-be Nobel Prize winner C. Milosz enjoyed the high life with low life in Italy, hobnobbed with a Viktor Yanukovych look-alike, and met his Muse on the rooftop of the Duomo: ($20, 6X9”, 130pp, Paperback ISBN-13: 978-1-68114-243-2, $35: Hardcover ISBN-13: 978-1-68114-244-9; $2.99: EBSCO EBook: 978-1-68114-254-8, LCCN: 2016904783, Release: August 1, 2016; Purchase on Amazon, Google Books, or Barnes & Noble): Chester Milosz, a very minor American poet who teaches at a very minor American college and aspires to win the Nobel, receives an invitation to a meeting of global high-flyers at the Otto Nabokov Foundation’s Ardor Haus estate in Caravaggio, Italy. The organizers are Dickey Lemon, a British billionaire who made his fortune in hamster bedding, and Joe Zsasz, an ex-communist functionary-turned-international consultant. The participants are a sundry collection of business people, policymakers, journalists, and academics involved in shady dealings with a corrupt Eastern European president who closely resembles Ukraine’s Viktor Yanukovych. Chester decides to go in the hope that a trip to northern Italy will help overcome his writer’s block. While at Ardor Haus, he experiences cultural misunderstandings, comic misadventures, near-encounters with inspiration, and three earthquakes. It eventually dawns on Chester that he’s been confused with the Nobel Prize winner, Czesław Miłosz, and that the conference is an elaborate scam. After a major earthquake destroys Caravaggio, Chester finds his Muse on the rooftop of the Duomo in Milan.